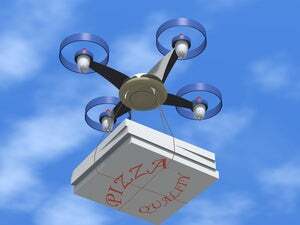 The UAV will be offered to businesses in Japan operating on relatively large parcels of land—big enough to warrant a flying security camera—such as shopping malls and supermarkets with large parking lots. “It won’t leave the premises but will record imagery of intruders leaving it,” said Secom spokesman Akihiko Takeuchi. The robot’s battery only allows it about 10 minutes of flying time, but it will automatically return to its station to recharge. The device has a high-definition camera and several sensors, but Secom would not provide details ahead of the drone’s official launch in June. Japanese companies are developing security solutions for drones as the nation becomes more aware of their threat potential. Soon after a drone with trace amounts of radiation was discovered on the roof of the prime minister’s office in April, the Tokyo Metropolitan Government banned the use of drones in public parks and gardens.